grandma's cookie jar: crafting with grandma - Valentine's Day Heart Craft for Birds! crafting with grandma - Valentine's Day Heart Craft for Birds! This morning I browsed a bit on Pinterest and found a fun and simple idea for a Valentine's Day craft my grandsons could make. It is not just a "heart" craft, but a craft which they can use to help feed birds! Yes, I said, "feed birds"! 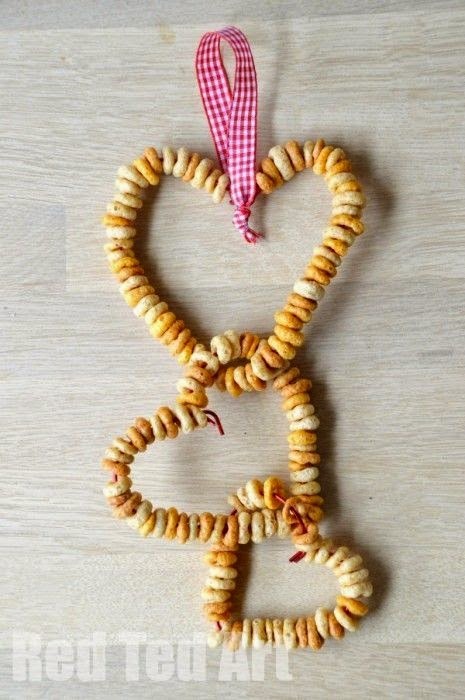 All you need are chenille wire and Cheerios. String cereal on your chenille wire, then twist the ends together to fasten. Bend into a heart shape. Take your next chenille wire and put through the first heart, add cereal, twist and bend to make another heart - this time you have the beginnings of a, "heart chain"! Add another heart or two and hang in a branch of a tree for birds to enjoy! What do you think? Is this a craft you might use with your grandchildren?